Two Quirk paintings will find lucky new owners on January 1, at Robert L. Fosters Auction House in Newcastle Maine. In scrolling through the on-line images there is an eclectic mix of paintings of interest. 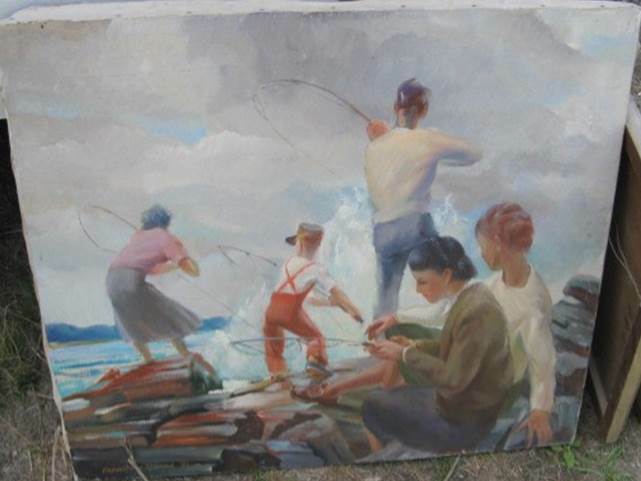 Coastal Maine was once a major summer getaway for artists and the legacies of that annual migration remain as inventory for auctioneers to resell in estate sales and a vibrant arts community today. 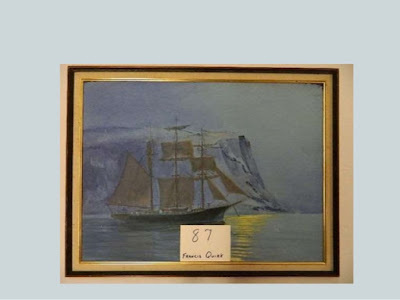 The fist painting is an oil on board measuring 23 ½”x17 ½" of a three masted schooner sailing past a dramatic coast. We have not examined this painting in person. The painting certainly is dramatic with the use of a dark blue pallet and the reflection of moonlight on the water. The sails have some wind in them, but several are still furled. Perhaps the captain is sailing slowly and more carefully to avoid the rocky hazards that are all along the Maine Seaboard. It appears that the ship is paying respect to the foreboding granite shore. We have a number of other maritime watercolor images in our archive which will eventually work there way into blog posts. We have also previously posted images of ships in the Lehigh University Collection, Link 1, Link 2) a water color of a battleship, and an oil of a ship under sail. 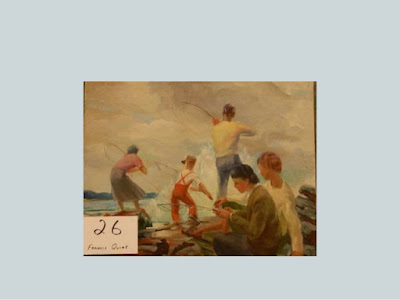 There is an interesting contrast among the figures as the standing fishers are taught and straining against there rods. The viewers eye is naturally drawn to the boy in the red overalls in the center and then moves through each standing figure in turn. After working standing bodies it then travels along the rod and down the line. But alas we cannot see the excitement on the other end. The feeling of activity is heightened by the wave action. On the other hand. the sitters are calmly focused on a rod and taking in the scene. They are in a different placid world. Perhaps they are a couple pondering other things or enjoying a quiet moment while others are caught up in a storm of activity. Like many of Quirk's paintings with people he has been aware of the importance of color and dressed the figures in a variety to add visual interest. It is not as finished as some Quirk paintings. We also have another image of the painting we had obtained from other sources earlier that does not have the label. In that view, one can see how the rocky coast adds another element.